The Seal Beach, Calif., clothing line Affliction is putting an emphasis on denim. It isn't alone. Several signatures are setting their sights on the comfortable and classic ruggedness of denim. Where Affliction has always stood out with denim is in the detail. Big pockets, artistic top stitches, big back pockets, metal buttons, and ornate rivets. It's these embellishments that help the jeans stand out, making them more wearable for concerts and events. ACE takes the lead for Affliction jeans. 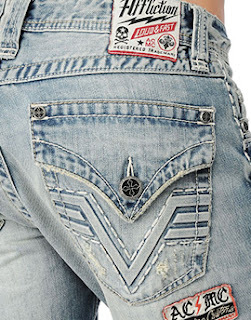 Almost always among the best sellers at Affliction are ACE labeled jeans. They are characterized by the detailed back pockets, side stitches, and cross emblazoned buttons and rivets. While pre-worn abrasion has taken a back seat among other lines, Affliction keeps the look intact by not overdoing it. The best of the bunch are the ACE 3-D Flap Capitals because they sport the button-down back pocket. But not all ACE jeans have the flap. The darker blue Basque Repo adds a scoop pocket instead. The fit is slimmer in the thighs but opens into a bootcut flare. The abrasion varies, but remains mostly light. Other Affliction lines also include Blake and Cooper. While there are some variations and crossovers, the Blake frequently adds a fleur-de-lis to the back pockets instead. The Cooper sticks with the classic "V" but adds some variations to what otherwise looks like the ACE design. All men's jeans are 100 percent cotton. Affliction denim isn't made for just men. 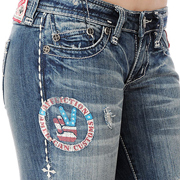 Although Affliction is generally a masculine line, it does make a limited selection of jeans for women. One of the more interesting designs (perfect for concerts) is the Jade Patriot. It also carries a bottom-down back pocket like the ACE line, but with more artistic embellishments in the patchwork and embroidery. The Jade Patriot is particularly interesting because the abrasion on the front breaks away to reveal an American flag. It's a unique look, but also pays tribute to where the jeans are made. While not everything by Affliction is made in the USA, its jeans are made stateside. If you are looking for something a little more understated, then the Raquel label might be a better fit. The skinny jean style carries the patchwork and top stitching. The alternative is more relaxed and straightforward. Affliction also adds a slight variation in the material blend, adding 2 percent Spandex to the cotton for a little more stretch. An alternative to Affliction from across the pond. If these American classic cuts won't fit a more urban look, then consider some of the recent entries from the United Kingdom. Voi Jeans have been on my radar for awhile, with a variety of styles for men and women from this designer in Preston, Lancashire. For men, the look carries a baggier fit in the thighs before tapering in at the ankles. Many of them break with the traditional 5-pocket classic, adding more to the front like cargo pants or sometimes just a single coin pouch. The styles are more limited for women's jeans, but include some interesting variations like elasticated cuffs on an otherwise loose-fit jean. For more diversity, try DL1961 Premium Denim. How things kicked off for Affliction several years ago. 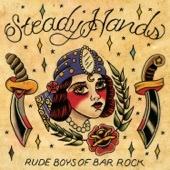 Sometime in 2005, Todd Beard and Eric Foss grew tired of selling designs for other major labels like Hurley and Quicksilver. Tom Atencio came on shortly after, not only because he once owned his own design firm and silk string company, but also because of his affiliation with fighters. But there is something else about Atencio some people don't know. The Affliction story isn't all luck. There was a lot of hard work behind the brand, with struggles inside and outside the ring. "You have to make sacrifices. Everything takes hard work. It takes time," he told the Sports Courier last March. "A lot of people want to just work the 9-5 or ideal hours and just get what they want as it comes along. That can work to an extent, but to be truly successful, you have to really work hard." Affliction Fall Denim Looks Up At 6.8 On The Liquid Hip Richter Scale. I've always been a fan of Affliction, even if the brand sometimes overpowers its smart designs. This isn't the case with its jeans, which tend to carry subtler markers (like its jackets and other accessories). In my opinion, this is when Affliction still works better, giving jeans what they need. 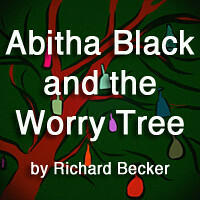 Sometimes you can find Affliction elsewhere, but be weary of knockoffs. The best rule of thumb if you don't buy direct is to always make detailed comparison. 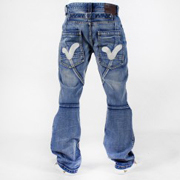 For some of the other jeans mentioned, visit DL1961 Premium Denim or Voi Jeans. Both brands are reasonably priced.